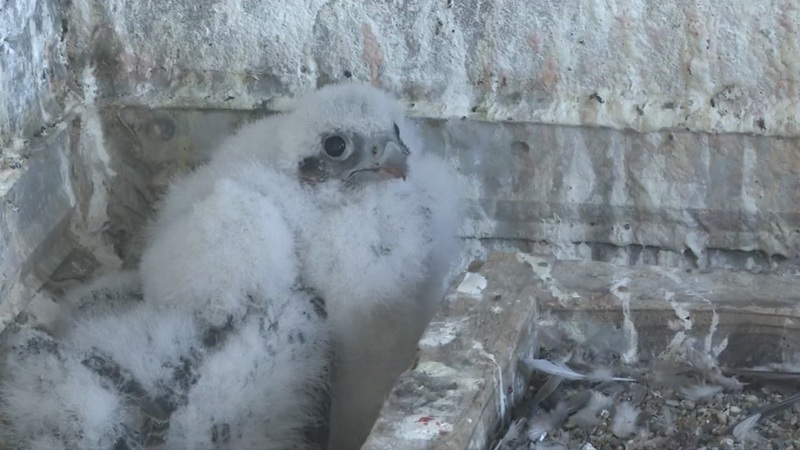 SAN FRANCISCO (KGO) -- Three young Peregrine Falcons are getting ready to do what they were born to, spread their wings and hit the sky. But not before researchers got a chance to place bands on them for further study. The chicks were born last month on the 33rd floor of PG&E's headquarters in downtown San Francisco. Researchers from U.C. Santa Cruz have been keeping an eye on them and expect them to be ready to leave the nest in about three weeks.But where they end up is anyone's guess. "Where do they go? We know that they came from a nest here in San Francisco. Where do they end up? Could be anywhere in California or farther beyond. And that gives us information about population, it's health," says Glenn Stewart of the U.C. Santa Cruz Predatory Bird Research Group. Today we learned the chicks are two males and one female. PG&E is now soliciting suggestions from customers to name the birds. You can weigh using the hashtag #PGE4ME on Twitter and Instagram, or by emailing to currents@pge.com. The deadline is Thursday, April 26. The names will be announced the following week. Click here to read PG&E's full press release on the falcons.